At its heart, Hanukkah (or Chanukah) is a great story of victory for the Jewish people. It is an annual festival held in the third month of the Jewish calendar, beginning on the 25th day of Kislev and continuing for eight nights. It is also known as the Festival of Lights, the Feast of Dedication, and the Feast of the Maccabees. Early in the second century BC, after Antiochus Epiphanes had taken control of the Seleucid Empire, he began persecuting and executing the Jewish people. The religion of Judaism was banned, and the Temple in Jerusalem was desecrated. In 165 BC, after years of persecution, execution, and desecration, Mattathias the high priest, and his son, Judah, took control of the underground Israelite rebel forces. Mattathias led Israel in a slow-but-sure uprising during the next three years that eventually defeated Antiochus and the rest of the Seleucids. Against all odds, and with minimal weaponry, the result was an overwhelming victory for the Jewish people. Because of this military success, Mattathias became known as “Mattathias HaMaccabee” (Mattathias the Hammer). The Israelites had reclaimed Jerusalem and retook the Temple; they cleansed it immediately, and rededicated it to the Lord. Hanukkah’s most recognized tradition is the lighting of the menorah. 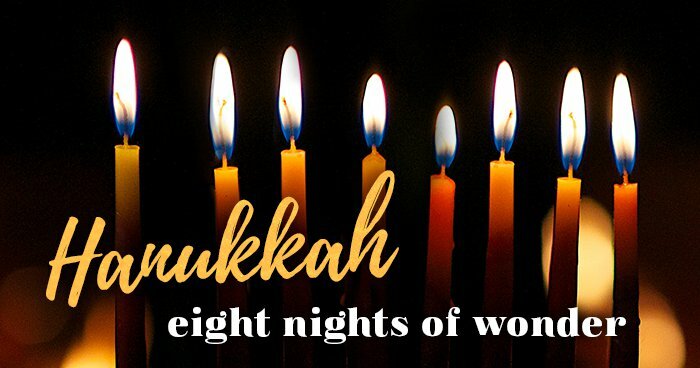 Over the course of eight days, Jewish families light a modified menorah—called a hanukkiah, which has eight branches (instead of the usual six) to symbolize the eight days of the original miracle. A blessing is recited each night as these special candles are lit. 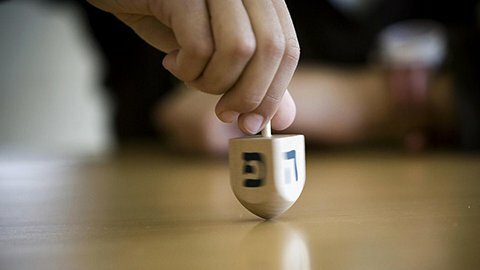 Perhaps the most well known Hanukkah amusement is the children’s game of dreidel. This little spinning top is four-sided, with a Hebrew letter on each side. The child spins the top and places a bet on which Hebrew letter will be showing when it lands. Children usually play for a pot of gelt (or chocolate coins covered in gold-colored tin foil). Visit the link below for more on this fun pastime. Gifts were originally not part of Hanukkah. In the beginning, gelt—money or chocolate coins covered in gold tin foil—were given to children as rewards (they are often tested in how well they know the story of Hanukkah). However, given that Hanukkah is celebrated around the same time of year as Christmas, Jewish children who saw Christian children receiving gifts became jealous. To appease their children, some Jewish parents eventually evolved the gelt-giving into gift-giving. And what would a celebration be without music? 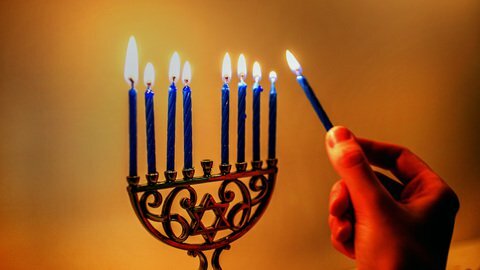 The links below list some of the more common and traditional Hanukkah songs, with lyrics translated in English, Yiddish, and Hebrew. Hanukkah’s festivities, like any good celebration, include lots of good food and music. 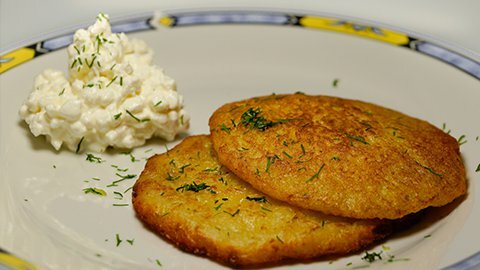 The mainstay of this holiday is the traditional latke, best described as a potato pancake. Also included are doughnuts, and other various fried foods, to commemorate the miracle of the oil. After reclaiming the Temple, the priests looked high and low for usable oil to keep the menorah lamps lit to complete the cleansing. They only found only one jug—enough for a day—that would do the job. But instead of lasting one day, this miracle oil lasted eight! During these eight full days, the Jews were able to make new oil, thus never having to be without light. The Festival of Hanukkah commemorates Israel’s victory, and celebrates the miracle of the oil— which is why this holiday is eight days (and nights) long. There are three brachos, or blessings, recited when Hanukkah candles are lit. "Baruch ata Ado-nai, Elo-heinu Melech ha'olam, Asher kid'shanu b'mitzvosav v'tzivanu l'hadlik ner shel Chanukah"
Blessed are You, Hashem our G-d, King of the universe, Who has sanctified us with His commandments, and has commanded us to Kindle the Chanukah light. "Baruch ata Ado-nai, Elo-heinu Melech ha'olam, She'asah nisim la'avoseinu, bayamim ha'hem baz'man hazeh"
Blessed are You, Hashem our G-d, King of the universe, Who has wrought miracles for our forefathers, in those days at this season. Blessed are You, Hashem our G-d, King of the universe, Who has kept us alive, sustained us, and brought us to this season. After these blessings are said, the following paragraph is to be recited, as well as the song is to be sung. "Ha'Neiros halalu anachnu madlikin al hanisim ve'al hanifla'os, ve'al hat'shu'os ve'al hamilchamos, sh'asisa la'avoseinu bayamim hahem baz'man hazeh, al yedei kohaneicha hakedoshim. Vechol sh'monas yemei Chanukah, haneiros halalu kodesh hem. Ve'ein lanu reshus le'hishtamesh ba'hem, eh'la lir'osam bilvad, ke'dei le'hodos u'lehalel leshimcha hagadol al nisecha ve'al nifle'osecha ve'al yeshu'oshecha." These lights we kindle upon the miracles, the wonders, the salvations, and the battles which you performed for our forefathers in those days at this season through Your holy priests. During all eight days of Chanukah these lights are sacred, and we are not permitted to make ordinary use of them, but to look at them in order to express thanks and praise to Your great Name for Your miracles, Your wonders and Your salvations. Ve'sham todah nezabe'ach | and there we will bring a thanksgiving offering. Chanukas hamizbe'ach." | the dedication of the Altar.